How to keep the original landscape or portrait orientation while resizing? 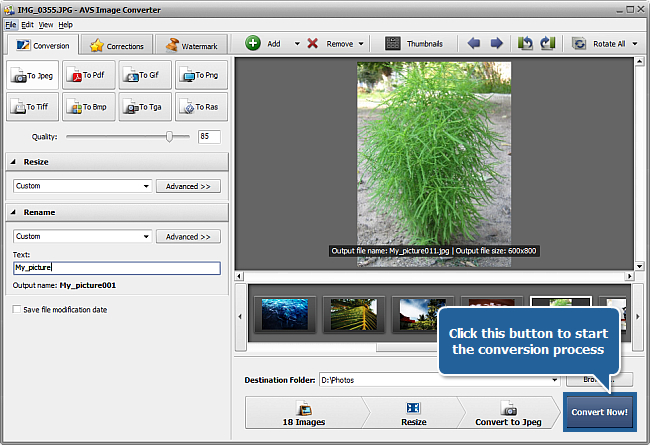 If you have a bunch of pictures from your digital camera and would like to resize all of them at once keeping the original image orientation AVS Image Converter is just what you need. Please, follow the instructions below to perform this task. Click here to download it. After the download is finished, run the AVSImageConverter.exe file and follow the installation wizard instructions. 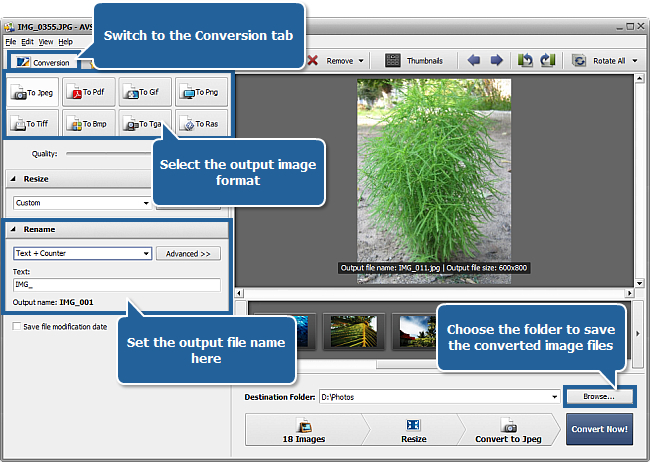 To launch AVS Image Converter you can double-click the corresponding desktop icon or follow Start > All Programs > AVS4YOU > Image > AVS Image Converter. To load image files you would like to convert click the Add button on the Toolbar. You will be able to load a series of images stored on your computer HDD. 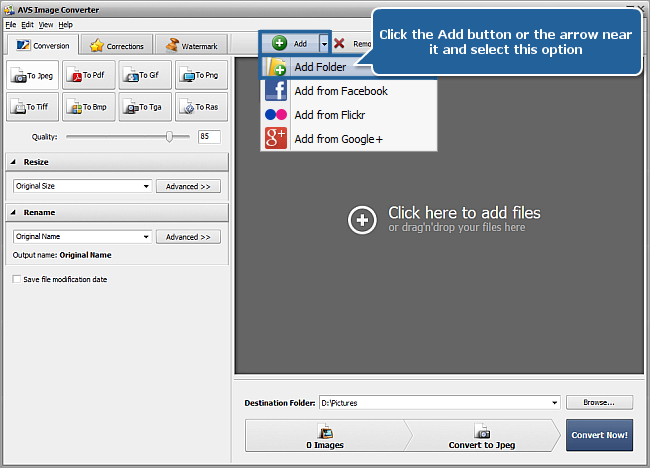 To load a folder with images stored on your computer HDD click the black arrow next to the Add button and select the Add Folder option. All loaded images will be displayed in the Preview Area. 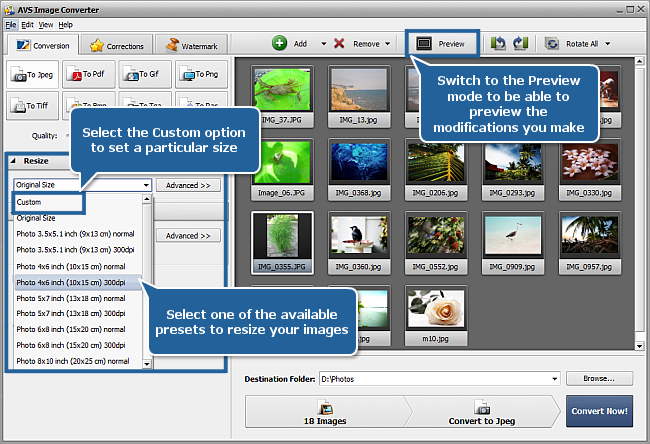 To resize your pictures use one of the available presets from the drop-down list of the Resize panel. To be able to preview the result you achieve switch to the Preview mode clicking the corresponding button of the Toolbar. If you need to fit your images to a particular size select the Custom option from the drop-down list. The Additonal Resize Options panel will open. Set the necessary Height and Width values using the keyboard. Your image will be resized according to the specified height/width values. Make sure that the Keep original orientation option is checked. When this option is selected the long side of the picture will be resized according to the largest value for width/height, and the short side will be resized according to the smallest value. This allows to keep the original portrait or landscape orientation and minimize the image area loss. 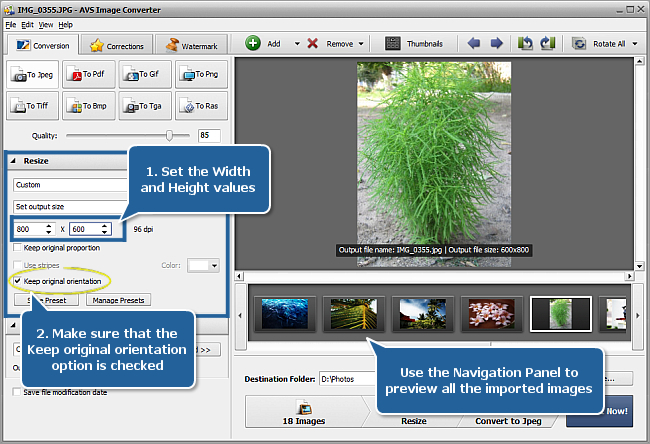 Use the Navigation Panel below the Preview Area to navigate between all the imported images and preview them. If this option is unchecked the width of your image will be modified according to the value specified in the left field and the height according to the value specified in the right field. 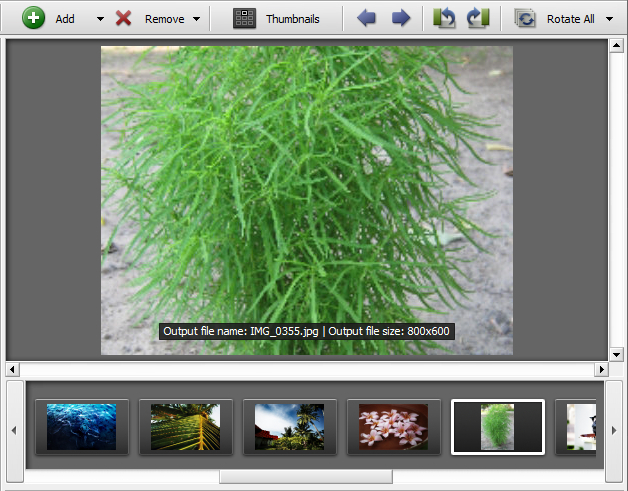 As a result you will receive a bunch of pictures in the same orientation with the same width/height parameters. But some image areas will be lost. After resizing your pictures you can make some auto-correction adjustments or apply some effects or add a visible text or image watermark to protect your images. To learn more on how to perform these tasks refer to the How to apply an effect to images and convert them to another format? and How to add logo to a group of images? guides. Return to the Conversion tab and select the output image format clicking the corresponding button. Set the output image file name choosing one of the available presets from the drop-down list in the Rename section or creating your own preset. 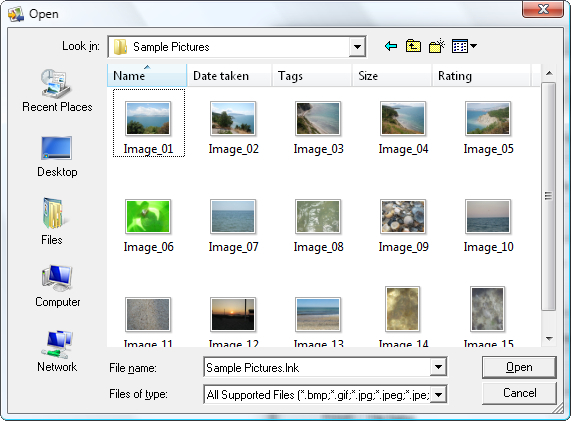 To set up a destination folder for the output images click the Browse... button next to the Destination Folder field and select a folder on your HDD or create a new one. Note: you can set up an output file location selecting one of the available folders in the Destination Folder drop down list. To do that open the list clicking the arrow. Click the Convert Now! button to start the conversion process. Note: the conversion process may take some time depending on the size and amount of the loaded images, as well as on the configuration of your computer. When the conversion is over you can open the folder with your images and send them to your friends or post on a web site.